KUALA LUMPUR (June 9): The construction and building materials sectors are seen to be in vogue in the near future, given the planned rollout of infrastructure development in the country. MIDF Research has maintained its “Positive” rating on the construction sector and said stocks in the industry were a clearer cherry picking, with lofty valuations taking a breather. In a note today, the research house highlighted that the current tide of liquidity took some heat off from the sector. “Despite the slump in 5 years [in] Malaysian Government Securities (MGS) of about 3.574%, risk-seeking has toned down — sectoral price to earnings (PER) aerated from last report dated May 24 of 26.7 times to current 23.3 times,” it said. However, the research house said robust liquidity is still prevalent, because current disbursement rate of RM5.59 billion is well above the sector’s 11-year median of RM4.17 billion or +34.1%. It explained that as the National Development Plan (NDP) was unveiled with a promise of an extension of Mass Rapid Transit Link 1 (MRT1), the sector would not be able to maintain the dizzying height of 26.7 times PER of March 2017. “Hence, FYE17-FYE18 could be the year that Kuala Lumpur Construction Index‘s valuations i.e. PER will normalize within our expectation of 17.5 times. “With the roll-out of the plan, we surmise that the Index will flit between 16.5 times to 19.5 times PER,” the research house added. Moreover, it said the cavalcade of potential infrastructure projects under the NDP reiterates the government's commitment to boost rural and urban connectivity. The research house noted that the roll-out is timely, since infrastructure project awards tumbled to only 26 in March 2017 (-85.1%YoY) or 142 projects in 1Q17 (-63.9%QoQ). “We consider that NDP would be the ‘cavalry’ to bolster the sector. We reckon the impact will be seen in FYE18-FYE19, as FYE17 may welcome the 14th General Election after the SEA Games in August,” it said. The research house view on earnings attractiveness is represented by the spread between 5-Y MGS and earnings yield of companies under coverage. To date, the spread has improved with companies such as IJM Corporation Bhd (TP: RM4.00, S*: +1.61%) and Cahaya Mata Sarawak Bhd (TP: RM4.62, S: +0.73%) turned positive, compared with May 2017. However, it said companies such as Malaysian Resources Corporation Bhd (TP: RM2.08, S: +6.02%) and small-caps such as Muhibbah Engineering (M)Bhd (TP: RM3.24, S: +5.02%), Gabungan AQRS Bhd (TP: RM1.49, S: +0.47%) and Vivocom International Holdings Bhd (TP: RM0.40, S: +6.51%) are most persistent, despite being inundated amongst other companies. “We regard the spread as moats showing the intrinsic strength of the respective companies. As such, we continue to favour Muhibbah (TP: RM3.24) and MRCB (TP: RM2.08) as our leading choice,” the report read. 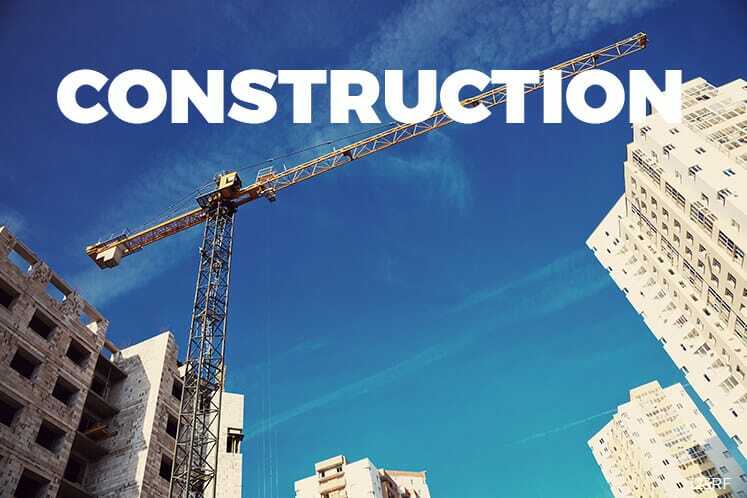 In a separate report, AmInvestment Bank Research maintained its “Overweight” rating on the building materials sector for the next six to 12 months, underpinned by the stronger demand for building materials, based on record order books of construction players in the country. “The prospects of the sector are bright. We are positive on all sub-segments other than the cement industry in Peninsular Malaysia,” it said. The research house said these include various mega projects such as the East Coast Rail Link (ECRL) (RM55 billion), Mass Rapid Transit Link 2 (MRT2) (RM32 billion), Pan Borneo Highway (RM16 billion), and mega-scale township development such as TRX, KL118 and others. It said other potential projects in the pipeline included the Pan Borneo Sabah highway (RM12.8 billion), light rail transit (LRT3) (RM9 billion), Gemas–Johor Bahru electrified double-tracking rail (RM7.5 billion), and Kuala Lumpur–Singapore high-speed rail (KL-Singapore HSR)(RM50-60 billion). “These mega projects will further boost the demand for building materials, such as steel, cement, and aluminium. “Our top large-cap and small-cap picks are Cahaya Mata Sarawak and Ann Joo Resources, respectively,” it said.